Implementation research is a new, dynamic, evolving area of inquiry. It is closely linked to the work of implementation, although there are key differences between doing implementation—actually putting into practice new policies, procedures, or approaches—and doing research on implementation. 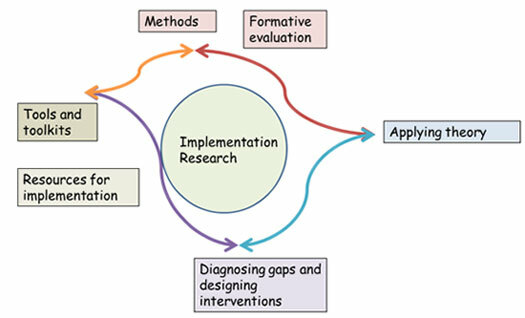 This Guide introduces you to approaches to doing research on implementation. Studying how implementation is done can lead to new insights to improve implementation practice. This Guide can be viewed as a trail map—you may start on any trail that you like and do not need to proceed in order. You may choose to read each section in the order below, or follow the trails to different sections according to your needs and interests. We hope you enjoy the journey, and find the resources and references useful. * Click on the sections of the trail map to take you to the corresponding sections of the Implementation Guide. Files are in PDF format, available for download in sections or complete document. Please note: This guide is an archived resource and is no longer being updated. Some of links and resources referenced in this document may no longer be available. Download the complete Implementation Guide (1.6 MB). What Does Systems Thinking Contribute to Diagnosis and Intervention Design? Henry Anaya, Ph.D.; Margaret Browning, Ph.D.; Laura Damschroder, M.S., M.P.H. ; Teresa Damush, Ph.D. ; Deborah Delevan, M.Ed. ; Christine Elnitsky, Ph.D., R.N. ; Rani Elwy, Ph.D.; David Ganz, M.D. ; Joan Griffin, Ph.D.; Hildi Hagedorn, Ph.D.; Diane Hanks, M.A. ; Christian Helfrich, Ph.D., M.P.H. ; Jennifer Hill, M.A. ; Tim Hogan, Ph.D.; Amy Kilbourne, Ph.D., M.P.H. ; Christine Kowalski, M.P.H. ; Julie Lowery, Ph.D.; Linda McIvor, M.H.S., M.S. ; Gerry McGlynn, M.Ed. ; Amanda Midboe, Ph.D.; Edward Miech, Ed.D. ; Brian Mittman, Ph.D.; Monica Matthieu, Ph.D., L.C.S.W. ; Mona Ritchie, Ph.Dc. ; Lorilei Richardson, M.S. ; Lisa Rubenstein, M.D., M.S.P.H. ; Anju Sahay, Ph.D.; Anne Sales, Ph.D., R.N. ; Arlene Schmid, Ph.D., O.T.R. ; Jeff Smith, Ph.Dc. ; and Blake Wood, M.Sc.. Please note that links to websites and other resources are not endorsements of the site, the organization, or content on those sites. They are provided to assist you in identifying potentially useful information, ideas, or additional resources.